Shakes, Michael, Tommy and John – four young boys enjoying the ups and downs of growing up in Hell’s Kitchen, facing the realities of domestic abuse and the appeal of running errands for gangsters, kept mainly on the straight and narrow by one ex-convict priest, Father Bobby (Robert De Nero). One blazing hot day a prank that goes wrong results in the beginning of a tale of misery and vengeance. The four boys are held in a home for young offenders where the guards’ word is law, and the consequences for disobedience are severe to say the least. 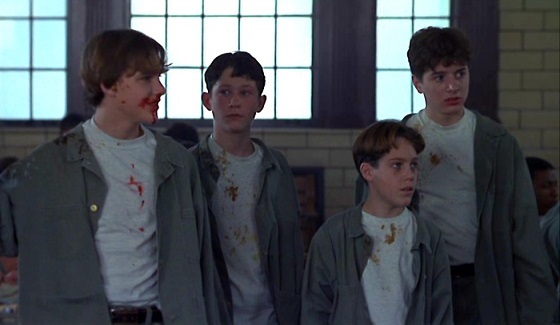 The hateful band of prison guards lead by Nokes (Kevin Bacon) make it their mission to destroy every semblance of happiness in the boys’ lives and to leave them with memories they will never forget – and which they vow to never share. Fast forward to ‘present day’ and we find two renowned members of the gang The West Side Boys, Tommy and John, facing murder charges over the death of one Sean Nokes – four eye witnesses but a plea of ‘not guilty’. Enter an assistant district attorney with an agenda, Michael, and a newspaper columnist, Shakes, willing to do anything to have justice prevail over the men who destroyed his childhood. Michael shares with Shakes his plan to take down the men who abused the boys all those years previous, while simultaneously getting their friends off for murder. While Michael maintains the façade of prosecutor in the courtroom, it’s up to Shakes to set in motion the many aspects of their plan, getting on side all the major players in Hell’s Kitchen and making sure Michael isn’t killed by The West Side Boys before his plan can be carried out. When Shakes needs the help of Father Bobby to fake an alibi for Tommy and John, he is forced to finally admit the abuse that took place in their youth, and leaves with the hope that Father Bobby will help, but without a definitive answer – will their whole plan come crashing down by asking a priest to lie in court and to go against his holy vows? Based on the (unproven) true story written by Lorenzo Carcaterra, though a story of abuse and vengeance, Sleepers is surprisingly not as dark and depressing as one may assume. Though the scenes alluding to abuse and torture do make for uncomfortable visuals, they are a necessity in drawing from the audience the hatred of the guards, and especially of Nokes, which are needed to understand why Tommy and John later commit the crime and why upstanding citizens try to help them get away with murder. Accompanied by an Oscar nominated score by John Williams, this is a film about the limits of right and wrong, and makes the viewer wonder just how far they would go for the ends to justify the means.